I have done a lot of bee watching this week. Several solitary bees species have emerged and males are patrolling the cherry tree, which is now blossoming. A male Red Mason bee landed to bask on the ivy that covers an east facing wall in the garden. Its legs got tangled on the silk threads of a lace web spider, Amaurobius similis. 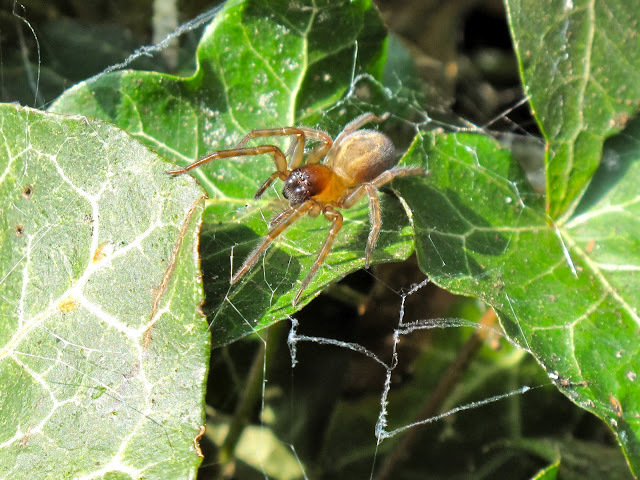 The spider quickly came out of her burrow, deep in the ivy. The bee disentangled itself before the spider got near and flew away, but the spider carried on checking, with short pulls of the web with her forelegs. There is nothing in my view better than sunlight to get a good shot. This is now my favourite Amaurobius portrait. On top of the natural light, the dark ivy background brings out the warm colours of the spider and also its beautiful blue silk. Amaurobius produce an uncommon type of silk using a silk spinning organ called the cribellum. This special silk emerges from thousands of spigots on one or more plates instead of normal spinnerets. Each fiber is extremely thin, and the spider then cards the fibers with a series of bristles in the shape of a comb on her back legs - the calamistrum - into a woolly silk, which has properties like the woolly side of velcro. Insects provide spines that get easily tangled into this silk with no need of glue. In Amaurobius, the silk is blue when fresh, with the spider working on new threads in the night. Interesting spider! An ivy wall is a great invertebrate habitat. We've got a short stretch facing north and the birds are often to be seen hunting through it. I agree Rob, it is a great bug habitat. Our ivy is still young, but I cannot wait until it also flowers, then ivy becomes a superb habitat when it flowers in the autumn.